Oregon is home to about 25,000 to 30,000 black bears, North America’s most common bear species. Generally black in color, they can also be brown, cinnamon or blond. Fast and agile, they are good swimmers and climbers who prefer forests, trails and streams. 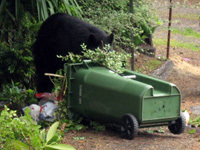 At home throughout Oregon, black bears are omnivorous and have a diverse diet including berries, fruit, grasses and plants. Although they will consume small mammals, insects and amphibians, these bears are not usually active predators. Q. Grizzly bears are brown and black bears are black. Right? A. Not really. Grizzly bears can be brown, blond, grey, reddish or sliver tipped. Black bears can be blond, cinnamon, brown or black. Q. Aren’t grizzly bears bigger than black bears? A. Don’t count on it. On average grizzly bears are larger than black bears however there is much variation in size among bears of both species. It is also very difficult to accurately estimate the size of a bear in the wild. Q. How can I tell the difference? A. There are no grizzly bears in Oregon so if you see a brown bear in Oregon, it is a black bear. Grizzly bears are being recovered in Washington State in the North Cascades. Grizzly bears have a distinctive shoulder hump. Black bears don’t. Comparatively, grizzly bears have short and round ears while black bears have large, pointed ears. In profile, the face of a grizzly bear is more concave (dish shaped) and broader than the black bear’s which is straighter and narrower. While ODFW has not tested these bear-proof products, a number of groups have. Do not leave food items or pet food outdoors or in tents.Clean all food preparation and eating utensils immediately after using them, and place them in vehicles or other sealed, bear-proof containers. Don’t leave soap, suntan lotion, candles, scented items outdoors or in tent. Don’t camp or hike alone. Bears are hunted in Oregon in controlled hunting seasons. Cubs and sows with cubs are protected. See current year’s Oregon Big Game Regulations (pdf) for more information. Important notice to bear hunters: ODFW researchers are asking successful bear hunters to submit the bear's premolar tooth and female reproductive organs to help with an important census study designed to more accurately estimate Oregon's bear population. For more information, call your local ODFW office. Be aware of surroundings at all times; be cautious. Be aware that by calling in an animal, you may attract a bear. Watch for fresh bear signs. Be careful when field-dressing a deer or elk. Make noise; talk and laugh so bears know you are there. If you have to leave a deer or elk carcass overnight, hang it at least 10-12 feet off the ground and 6-10 feet from nearby trees in an open area.